Aussie video slots pioneers, Ainsworth, have some previous when it comes to land-based slots, with many of the developer’s games at the top of many players’ must-spin lists. A lot of Ainsworth’s games have made the migration over to the online world, and their nature-themed slot, Winning Wolf, is another in the pantheon of solid offerings. At first glance, Winning Wolf is pretty similar to another of Ainsworth’s calls of the wild – Eagle Bucks – and much of the feel and atmosphere has been transplanted (together with, unfortunately, a seeming lack of music or FX). 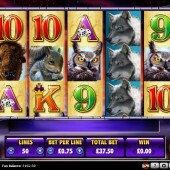 Along with the regular poker 10-through-Ace symbols, we get a lush outdoorsy backdrop which puts you in the mood, while elsewhere on the reels are squirrels, the titular wolf, owls, buffalo, deer and mountains. Betting starts at a line bet of just $0.01, but pay-line choices are fixed in increments – you can choose from 1, 10, 25, 40, or 50. The Wolf is Wild in the game – as you’d expect – and it substitutes for all regular symbols other than the Scatter. The Scatter – the Mountain – pays in any position, and three or more Scatters anywhere triggers a free spins round where 8 freebies are awarded. 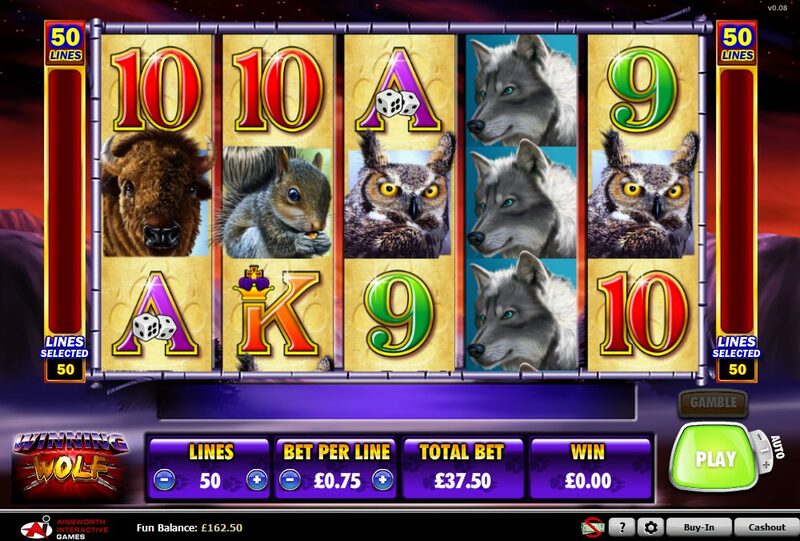 The free spins reels are a different set – mixing things up a little – and during the free spins round (a little like the eagle in Eagle Bucks) if a Wolf appears on reels 2, 3 or 4, he will be held in place for the duration of the feature. Suddenly, those measly 8 free spins seem a little more generous. You can also trigger another five free spins by hitting three more Mountain Scatters anywhere. In classic Ainsworth style, Winning Wolf won’t offer too many thrills but for some neat features in the bonus round – if you can trigger it regularly enough – the game does deliver. Check out some of WMS Gaming’s online conversions of their classic American-themed slots like Buffalo Thunder and Buffalo Spirit if this has got you in the mood for more.